The RVA Solar Fund, a component fund of the Community Foundation for a greater Richmond, seeks to support local governments, K-12 public school systems, and non-profit organizations in the greater Richmond region that wish to go solar on site. 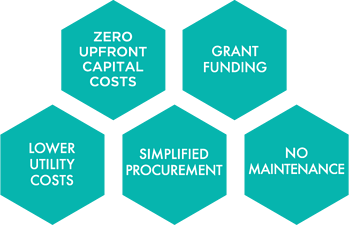 Our competitive grant program is open to entities that have entered into a solar power purchase agreement (PPA) with our partner, Secure Futures, a Virginia solar developer and Certified B Corp. With a PPA, you will only pay for the electricity generated by the solar equipment that Secure Futures will install, own, and operate. The RVA Solar Fund will leverage approximately $12 million in private investment to catalyze 5 megawatts of generation (~15,000 solar panels) on public or non-profit sites. Applicants will enjoy zero capital costs, no maintenance obligations, and reduced utility costs while avoiding the equivalent C02 emissions of burning 5 million pounds of coal per year and producing the energy equal to 700 homes’ total annual electricity usage. Successful PPA applicants will be eligible to apply to the RVA Solar Fund incentive grant program for up to $100,000 to support administrative costs, staff and teacher training, or other sustainability initiatives related to your solar effort. Final grant amounts will depend on the impact and merits of the applicants’ proposals. Public-school systems, local governments, and 501(c)(3) charitable organizations in the Community Foundation's service area (the cities of Colonial Heights, Hopewell, Petersburg, and Richmond as well as the counties of Chesterfield, Goochland, Hanover, Henrico, and Powhatan) are invited to participate with the RVA Solar Fund. Additionally, K-12 public school districts and local governments from the counties of Amelia, Charles City, Cumberland, Dinwiddie, Essex, Gloucester, King and Queen, King William, Lancaster, Mathews, Middlesex, New Kent, Northumberland, Prince George, Richmond, and Westmoreland also are eligible. If your non-profit organization, school district, or local government is interested and eligible for this grant, please submit your non-binding Notice of Interest (NOI) soon - and not later than January 15, 2019. Many local governments, school districts, and non-profit organizations in Virginia would like to have solar arrays at their sites but can’t access the capital needed to install their own equipment. Through this initiative, a power purchase agreement (PPA) with Secure Futures uses private investment to build and operate the solar arrays. The public or non-profit entity then enjoys reduced annual energy costs by purchasing the solar power generated by these arrays. Finally, the grant funds can be used for administrative costs related to executing the PPA, for educational materials and teacher training related to the on-site solar, or for other sustainability initiatives. For local governments and public schools, procurement is streamlined due to the cooperative purchasing option established by Albemarle County’s July 2014 RFP for a solar PPA. That RFP already has been used successfully by Albemarle County Public Schools (2015), Lexington Public Schools (2015), Richmond Public Schools (2018), and Augusta County Public Schools (2018). Click here to view executed legal opinions affirming the use of cooperative purchasing. This new initiative to support public and non-profit entities going solar represents a pioneering partnership between the Community Foundation for a greater Richmond, local donors, local and national nonprofits, and a Virginia-based, Certified B Corp solar developer. The result is an innovative solution to advancing clean solar and energy and cost-savings for public entities and non-profit organizations in the greater Richmond region. Solar's time has come - and everyone benefits. 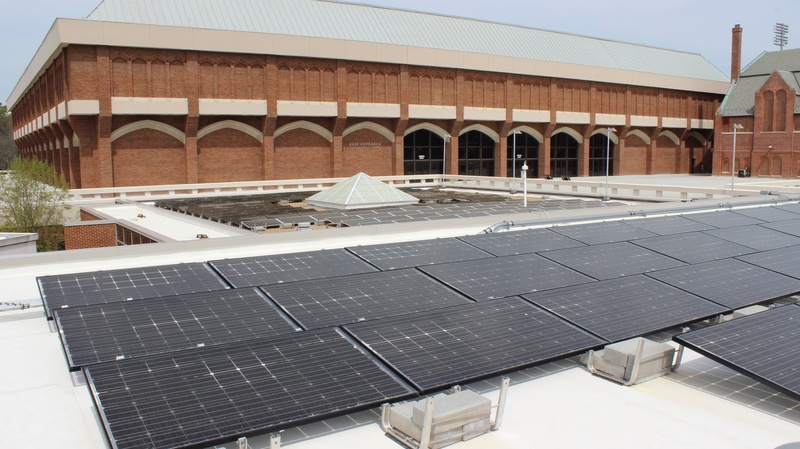 Solar power generation system on the University of Richmond - installed 2016. Starting October 1, 2018, non-profit organizations, public-school systems, and local governments may apply to the RVA Solar Fund for grants of up to $100,000. Final grant amounts will depend on the impact and merits of the applicants’ proposals. Notices of Interest from public entities and non-profit organizations signaling their interest in the program and providing documents for an initial technical screening will be accepted until January 15, 2019. Applicants are encouraged to complete all phases as soon as possible in order to allow sufficient time for their leaderships' review and approval of the program details. Nonbinding Notices of Interest are due by 5:00 p.m. on January 15, 2019. Qualified applicants must execute a PPA with Secure Futures by May 31, 2019. Full grant applications are due by 5:00 p.m. on June 13, 2019. Program staff will host an informational webinar for potential applicants and other interested parties on November 29 at 11:00 a.m. Click here to register.